In this study, we demonstrate how exploiting the timing of news adds significant value to our sentiment indicators and their performance when constructing short-term, long-short equity strategies. We reveal that the performance of our strategies is strongly influenced by the large volume of news clustered in the pre-open and after-close. By paying special attention to these volumes of news in the construction of our sentiment indicators, we achieve remarkable improvements in signal performance. The Big Data revolution has enabled new ways of constructing orthogonal alpha signals around alternative data. However, the performance of such alpha signals strongly depends on how well the underlying data and data generating process is understood especially when intraday or seasonal patterns are considered. This idea is not novel when applied to market data. The search for seasonal or intraday return patterns has received tremendous attention in the past, and significant research efforts have focused on exploiting the dynamics of intraday trading volumes and prices. However, in contrast to market data, most alternative data, and especially news, is available in an uninterrupted fashion 24 hours a day, 7 days a week. Hence, a different behavior can be expected. While intraday trading volume can be described by the so-called “smile behavior”, with most of the volume taking place immediately after the open or just prior to the close, constructing signals from news content or analytics requires a deeper understanding of news patterns. In particular, we may expect that news arriving inside vs. outside market hours to have a very different price impact. 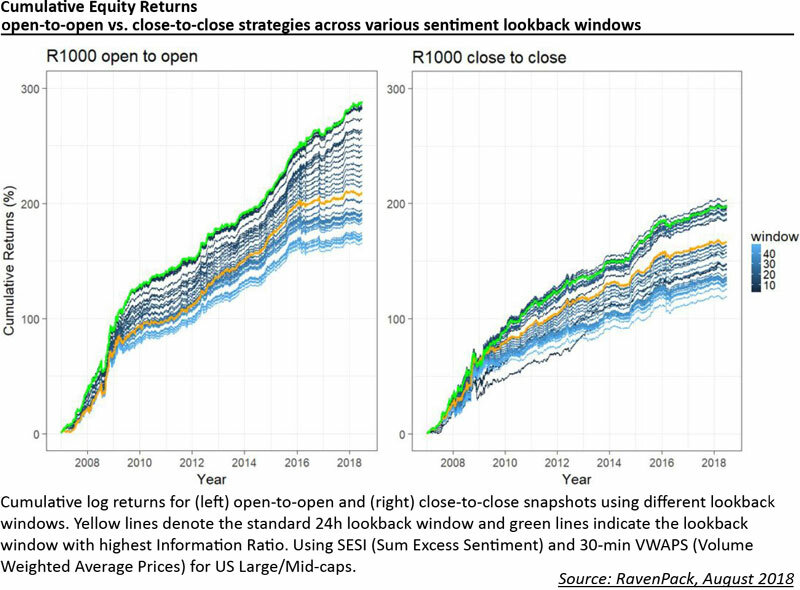 In previous research [1-7], we demonstrated the predictive capabilities of RavenPack Analytics (RPA) focusing on sentiment-based indicators constructed over a default lookback window of 24 hours. In this paper, we will take advantage of intraday news patterns and illustrate how these can dictate how we design and implement our sentiment-based signals. In particular, we will show that exploiting the timing of news adds significant value to our sentiment indicators and their performance. For this purpose, we will consider different lookback windows in our indicators and use returns based on Volume Weighted Average Prices (VWAP) to enable trading at the open vs. close in a realistic manner. The paper is organized as follows. In Section 2, we introduce the data and the sentiment indicator used as part of our study. In Section 3, we compare the portfolio performance using different lookback windows, across both a market open and close snapshot. In Section 4, we attribute signal performance to the intraday news distribution, while Section 5 discusses the consistency of strategy performance over time. In Section 6, we consider the potential value of allowing for an additional trading point per day, i.e. trading around both the market open and the close. In Section 7, we evaluate the impact on performance of expanding the VWAP window from 30 min to the entire trading day, to capture more liquidity. Finally, in Section 8, we provide our conclusions.